Weill Cornell is one of 200 institutions that make up the Children’s Oncology Group (COG), the world’s premier organization dedicated to eradicating childhood cancer. Dr. Mark Souweidane and Dr. Prajwal Rajappa lead the Weill Cornell Pediatric Brain and Spine Center’s participation in a long-term study of brain tumor tissue samples collected from pediatric patients around the world, with the goal of understanding the molecular profile of these tumors. This lab update about our COG project was contributed by Dr. Rajappa. This COG study is extremely important given the lack of effective treatments available for pediatric brain tumor patients. We are collecting brain and spinal tumor tissue from pediatric patients treated at COG facilities around the world, providing a repository for long-term storage of those specimens. This study allows us to make specimens available to expert researchers both here in the United States and abroad who are working to understand the biology of these tumors. These repository-driven studies utilizing human tissue serve as the platform for meaningful translational research, which relies on laboratory findings that can be quickly applied to develop new treatment options. The rapidly evolving science of human genomics has the potential to change how physicians diagnose and treat cancer, but molecular studies require access to tumor tissue, which has been extremely limited—especially when the tumors are rare. There’s a particular shortage of pediatric tissue specimens available for ependymomas, thalamic gliomas, brainstem gliomas, diffuse pontine gliomas, gliomatosis cerebri, low-grade gliomas, and primary GBMs. The limited number of specimens available for research within any single institution can make it impossible to conduct statistically powerful and high-impact molecular research. Therefore, participation from multiple institutions is essential. 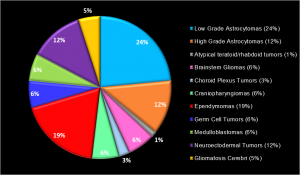 Spectrum of brain and spinal tumors that comprise the Weill Cornell Pediatric Central Nervous System Tumor Repository, as of Summer 2014. Here at Weill Cornell, with a world-class pediatric service that draws patients from near and far, we have gathered a wide variety of samples of many pediatric brain and spine diseases in our repository, making us one of the top member institutions in the COG. In fact, in our first full year of participation in this study (2012), Weill Cornell ranked eighth out of 142 participating institutions in terms of number of pediatric patient samples enrolled. This year, we are poised for our highest patient enrollment on study. As shown in the pie chart at right, we have accrued a wide array of pediatric central nervous system (CNS) disease entities in our departmental repository that will serve as valuable material for further genomic sequencing and translational research. Within Weill Cornell, we have developed streamlined collaborations with other departments, such the department of pathology, which will ultimately advance our understanding of the biology of pediatric brain tumors and further initiate multi-disciplinary studies. Solidifying our role at COG, at Weill Cornell, and within the cooperative group setting may also serve as a mechanism for securing federal funding sources. Today, encouraged by our success with both the national protocol and our multi-disciplinary collaborations in place here at Weill Cornell, we embark on a regional effort that will bring institutions from the tri-state area together to facilitate scientific progress. To provide our patients with the very best therapeutic regimens, it is paramount that we consolidate our tissue resources in a multi-institutional pediatric brain and spine tumor repository in the New York area. We have proposed the creation of a scientific advisory panel to regulate the flow of tissue for various scientific proposals that will be evaluated for investigator scientific merit, publication profile, and preliminary data. This proposal is currently under review by the Weill Cornell Medical College Institutional Review Board (IRB) and we aim to start accruing patient specimens regionally by early this fall. Having adequate samples available will facilitate work to be done by Dr. Jeffrey Greenfield and Weill Cornell’s Institute for Precision Medicine in Pediatrics. In an exciting new study approved just this month by the IRB, Dr. Greenfield and the Precision Medicine team will seek to develop tumor-specific targeted therapies. Our participation in the pediatric neuro-oncology cooperative group, along with enhancing our own intra-institutional collaborations, is of utmost importance as we seek new treatments for currently incurable pediatric brain tumors. This collaborative approach to pediatric brain tumors is critical to helping us find answers that will provide hope to these children and their families. We at the Weill Cornell Pediatric Brain and Spine Center express our sincere gratitude to the families in sharing a vision for a future where effective treatment options can be afforded to these children. With your support of our research initiatives, we actively work towards that brighter day.